I’ve written endlessly about wanting to upgrade my now ageing 2006 model Mac Pro 1,1. I’m almost boring myself about it, but luckily I’m a geek so can quite happily wax lyrical on the subject. Here I go again. A quick recap. Apple’s professional top of the range computer is called the Mac Pro. It was first released in August 2006 as a replacement for Power Mac G5. I bought one of these machines in April 2007 and it’s served me astonishingly well being a reliable, stable and enjoyable machine to carry out my day to day work on. There comes a time, however, in every computer’s life when it becomes obsolete. Luckily, for Macs, this generally takes much longer than their downmarket Windows based cousins. Yes, Macs are more expensive than PC’s but boy do you get your money’s worth out of them! I first thought that my Mac may need upgrading way back in Spring 2011. At the time I knew it wouldn’t be necessary for a year or so but in 2012 it quickly became clear that Apple didn’t plan to upgrade the hardware that had last seen a refresh in May 2010. To cut a long story short – you can read my previous blog entries to fill in the gaps – it wasn’t until 19 December 2013 that a new machine finally became available for ordering. The Mac Pro 6,1 also referred to as the “Late 2013” model. I placed my order on launch day. Perhaps not surprisingly, estimated shipping dates slipped first to January then, after a few hours, to February. It stuck at February until mid January when it then slipped again to March (where it remains for now). I was lucky – I just got my order in minutes before the estimates slipped to February. With this in mind, though, I was pretty sure my machine would ship pretty late in the month. It’s been a tough month. OK, so there are plenty of people who’ve had a much tougher time such as those suffering flooding in Somerset, so I use the word “tough” in a kind of loose “I just stubbed my toe” or “I just cut my fingernails too short” kind of way. In other words, it’s not really tough, more a minor irritant. There have been a few of us who ordered our machines around the same time sharing this whole experience on a thread on the Mac Rumors forums. My thanks go to Scissors, Subdiv, motegi, PPOP and many others on that thread. We’ve had a laugh in amongst the concern at the damage we’ve been causing our keyboards with continual presses of the refresh key while we have all been waiting for our order status messages to change from “Processing – Dispatch: January”. Mine stayed like that for no less than 41 days, finally flipping over to “Preparing for dispatch” late (UK time) on 29 January before leaving the factory in Austin overnight. At the time of writing this (late in the evening on 30th January 2014) my Mac Pro has spent a pleasant day first of all at Dallas Fort Worth (no doubt looking through Duty Free and purchasing bottles of absinthe and export Swiss watches) before moving on to Louisville, KY and finally Newark, NJ. It’s getting closer, but I hope it’ll have made the effort to get on a plane by the time I get up in the morning. My delivery estimate from UPS is Tuesday 4 February which actually suits me fine. I’ve got a busy few days (even the weekend is looking pretty full on) so Tuesday is probably the first day I’ll have any time at all to look at a new computer; so the fact it won’t be arriving until then is no great problem for me. Perhaps the main reason why the ordering of the new Mac Pro has been somewhat of a strained experience for many of us is down in no small part to the length of time Apple has taken to update their flagship computer. As I’ve written previously, I fully appreciate the reasons why it had to be like that. 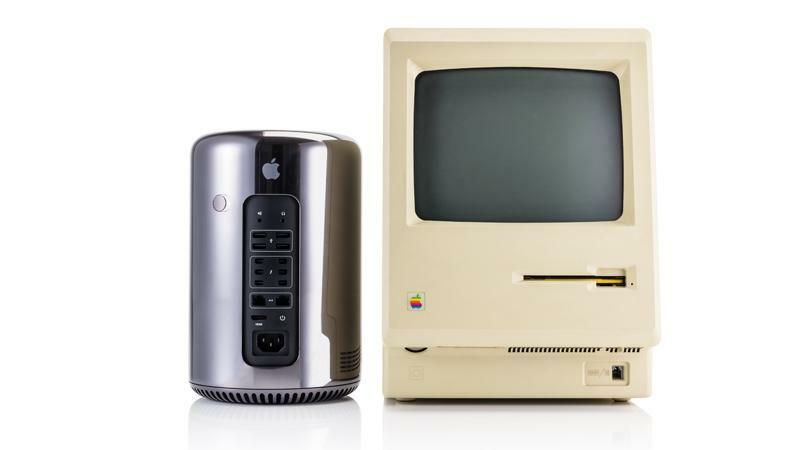 The old Mac Pro form factor, although iconic, wouldn’t have been at all suitable for Thunderbolt and – like it or not – storage has moved on since the days of shoving everything into a tower. Some disagree about this final point at this moment in time, but I feel pretty sure that Apple will once again be proved right in their approach. They were right about the demise of the floppy drive, even about avoiding Blu-Ray altogether and they’ll be right about this too. It’s great to see the innovation on the Pro line and it should give those of us who need powerful equipment to carry out our day jobs a sense of optimism that technology giants like Apple realise, after all, that iPads are for consumers and machines like the new Mac Pro are for the content creators who give the consumers the things they want to consume. Long may that continue! This entry was posted in Computing, Hardware, Technology on January 30, 2014 by AJClayton. Happy 30th Birthday Apple Mac. But where’s my new one, eh, Tim? 30 years ago today on 24 January 1984 the first Apple Macintosh computer was launched. It revolutionised desktop computing, introducing a whole new way of working and interacting with computers. It’s something Apple’s been rather good at over the years. Although I occasionally worked with Apple Macs during the 1990’s it wasn’t until January 2005 that I jumped on the bandwagon myself at home. My first Mac was a Mac Mini, a wonderfully understated and yet powerful box that was marketed with “bring your own keyboard, mouse and monitor” something that would become a requirement again 9 years later when the new Mac Pro launched. I was instantly hooked. The computers at work had run OS 9 (and before that OS 7) so having OS X 10.3 Panther was very exciting. Its amazing how quickly I forgot all the grief that Windows had given me over the preceding decade. I gradually came to love the OS and the hardware which had clearly been designed by people who care about what they do and give the attention to detail that had been sadly lacking in my computing life up until that point (perhaps with the exception of the Amiga). The Mac Mini didn’t stay as my only Apple product for long. It was followed by the first Intel MacBook, the very first generation Mac Pro and then later an iPhone and iPad. The MacBook lasted me an astonishing 7 and half years before it was finally replaced only recently with the MacBook Pro with retina display I’m typing this on now. My Mac Pro has served me even better lasting from April 2007 (although strictly speaking it’s the August 2006 model) right up until today… well, that actually brings me on to my next point. I’ve written on here before about how Apple took their eye off the ball when it comes to support for professional Mac users. I don’t want to go on about that on the Mac’s birthday – I’d rather eat some birthday cake washed down with oodles of real ale (is that normal?) – however it’s something which has caused me much consternation of late. The Mac Pro received 3 updates between its launch in August 2006 and mid-2010 with a final “bump” in June 2012. Basically, from Spring 2011 right up until the launch of the redesigned Mac Pro in December 2013 there was nothing for Pros to get excited about, just a promise from CEO Tim Cook in Summer 2012 that “something great” would come “later in 2013”. As it turned out very much later! In actual fact, for technical reasons I fully understand why Apple took so long to come up with a new design for the Mac Pro. I’ll write more about that in a future update probably as it’s not so much the delay that’s the problem as the total lack of communication. Apple’s famous secrecy gone mad. However, on the Mac’s birthday, while feeling optimistic about it’s future (even for pro users) I feel slightly miffed that it’s taking Apple so long to send me my new cylindrical “Late 2013” Mac Pro. Even on Apple’s 30th anniversary Mac web pages the new Mac Pro is given a year in the machine’s timeline of “2014”. Tells you all you need to know. For me. I placed my order on launch day (19 December) and was told my new “Darth Vader” Mac Pro would ship in “January”. Here I am 37 days later with no news. Apple actually put an authorisation hold on my bank card for the full amount of the machine on Tuesday 21 Jan only for that to drop off again 2 days later. That got my hopes up a bit at the time so you can imagine how I’m feeling seeing yet another week go by with nothing to report. However. I said I wouldn’t harp on about that on the Mac’s birthday so I’ll stop there. There’s still a week of the month to go, so a week for Apple to keep their promise to deliver the new hardware when they said they would. I hope they don’t let me down. In conclusion, then, the Mac’s birthday shouldn’t be an occasion for me to lob insults at Apple because I don’t have my new toy yet. In fact, the Mac (and more specifically Mac OS X) has enabled me to almost forget I’m using a computer and to concentrate on getting my work done. It’s stylish, unfussy, stable, reliable and by far the best technical equipment I’ve ever owned. Happy Birthday, Mac, let’s hope there are many more to come! This entry was posted in Computing, Hardware, Technology on January 24, 2014 by AJClayton.